OK, to give an example - How does one customize Kubuntu Search and Launch (with the Plasma-Netbook interface)? When the user posted the answer it clearly wasnt an answer - in this case it was just a bunch of questions as you can see by the edit. So I flagged the answer. Sometime later the poster changed his answer to what looks like a valid answer. So my question is - being a good citizen (!) 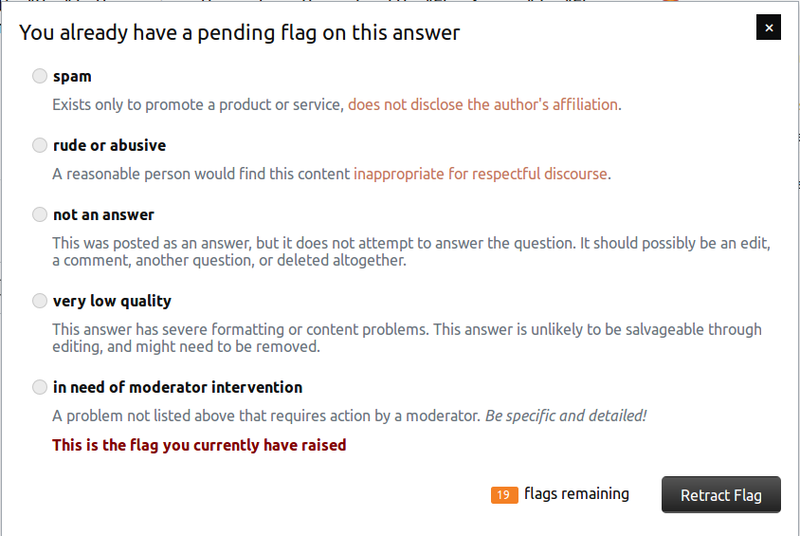 - I flagged the answer correctly, but no moderators were around to deal with this flagging. When they are, they'll reject my flagging seeing only the now correctly editing answer - thus "penalizing" my flagging reputation. There doesnt appear anyway to "undo" my flagging - or is there? How to delete my flag?